This product provides increased softness and smoothness to hair strands, leaving hair hydrated and silky to touch, with balance and shine. It is formulated with vegetal keratin, which us resistant to rinsing and thus remains in the hair longer, keeping the hair more flexible and shiny. 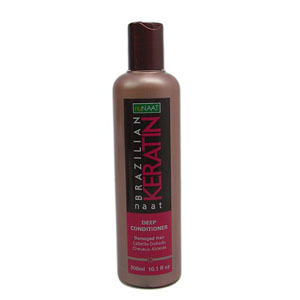 It is ideal for hair that has been straightened, dyed,exposed to sun. wind, seasalt and chlorine as well as blow-dried or ironed. Aqua (Water), Cetearyl Alcohol, Paraffinum Liquidum (Mineral Oil), Cyclopentasiloxane, Cetrimonium Chloride, Alcohol, Parfum, Behentrimonium Chloride, Isopropyl Myristate, Hydroxypropyl Starch Phosphate, Ceteareth-20, Polymnia Sonchifolia, Root Juice, Xanthan Gum, Hydrolyzed Soy Protein, Hydrolyzed Corn Protein, Hydrolyzed Wheat Protein, Citric Acid, Methylchloroisothiazolinone, Methylisothiazolinone.